MELBOURNE, Australia, March 20, 2013 (ENS) – Sea Shepherd Australia this morning welcomed to Melbourne its three ships and 110 crewmembers after their campaign defending whales in the Southern Ocean against Japanese “research” whalers. All three Sea Shepherd ships – the Steve Irwin, the Sam Simon and the Bob Barker – were damaged after colliding with the Japanese factory ship Nisshin Maru. The Japanese Institute of Cetacean Research, a government body that runs Japan’s whaling program, claims that Sea Shepherd “sabotaged” its factory ship. Sea Shepherd claims the much larger Japanese ship deliberately rammed the whale defense vessels. The Sea Shepherd crews endured attacks by concussion grenades and were hit with water cannons as they tailed Japan’s four whaling vessels, interfered with their whale killing activities and tried to block them from refueling. The Japanese vessels had to refuel from a contracted tanker ship, which was engaged after Australia refused to allow the whalers to refuel in Australian ports. 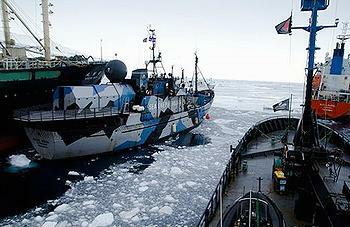 “Sea Shepherd’s ninth campaign to Antarctica was named Operation Zero Tolerance because illegal whaling in the Southern Ocean Whale Sanctuary in violation of an Australian Federal Court ruling prohibiting the killing of threatened, endangered and protected whales cannot, and will not, be tolerated by Sea Shepherd,” said Hammarstedt. Japan sets itself an Antarctic quota of 950 minke whales plus 50 fin and 50 humpback whales annually despite a global moratorium on commercial whaling that took effect in 1986. International Whaling Commission regulations permit lethal “research” whaling as long as the meat is used and not discarded. Whale meat appears at Japanese markets and in sushi bars. “Sea Shepherd Australia’s Operation Zero Tolerance has been Sea Shepherd’s most successful campaign to date,” said Jeff Hansen, director of Sea Shepherd Australia. 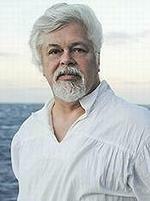 Hansen co-led this season’s whale defense campaign after Sea Shepherd founding president Captain Paul Watson stepped down in December 2012 to comply with a U.S. court ruling in a case brought by Japanese whaling authorities. Watson observed Operation Zero Tolerance activities from aboard the Steve Irwin, but he was not aboard the vessel when it arrived in Melbourne today. “A man that is an Australian hero, doing the work that the Australian government refuses to do, that the Australian public want done, is once again forced to go into hiding,” Hansen said. 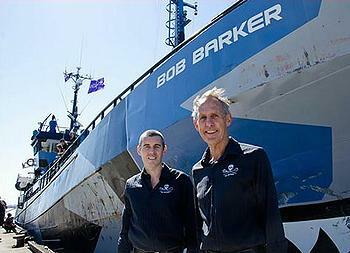 The other co-leader of Operation Zero Tolerance was former Australian Greens leader and senator Bob Brown who now chairs Sea Shepherd Australia. He stood on the pier beside the group’s damaged vessels and asked the government to clarify whether or not it intends to arrest Watson. “There have not been charges laid against him that we know of, but if Japan is seeking to have Paul Watson apprehended, let’s have the Australian government say so,” Brown told reporters. An immediate question in Parliament from Greens MP Adam Bandt, who represents Melbourne, drew clarification of the government’s position from Australian Attorney-General Mark Dreyfus. “I can confirm Mr. Watson is not subject to any arrest warrant under Australian government jurisdiction,” he told parliament. 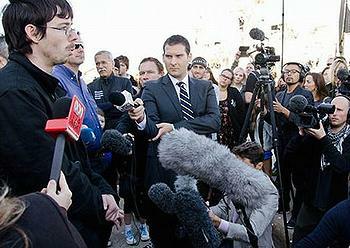 Dreyfus would not reveal whether Japan or any other country has requested Watson’s extradition, a requirement before an arrest warrant can be issued. Earlier this month, Germany dropped an arrest warrant for Watson that was originally issued last year at the request of Costa Rica. To avoid arrest, Watson jumped bail, forfeiting some $300,000, and left Germany last July. He is still wanted in Costa Rica over a 2002 incident over a shark finning vessel, although Costa Rica has banned shark finning. “The really big welcome awaits Sea Shepherd founder, Paul Watson, when and if the government clears his path to Melbourne,” said Brown.